His fond memories were, however, tarnished during his participation in Good Friday services at the cathedral last week. As bowed my way into the cathedral great memories came flooding back. Soon disappointment emerged as a young usher stopped me from heading to balcony of the cathedral. I was trying to make my way up there because it was packed below. To my dismay, the usher said: "It is not open upstairs yet?" Since when was the house of the lord closed? Then another lady usher said there were already people upstairs there and I could go up. Then as the service began, a notice on the big screen read: 'Not to read aloud’. As the service drew to an end with the veneration of the cross, the queue was naturally long as only one big cross was used for the veneration at the foot of the altar. The congregation was advised to follow the instructions of the wardens. Some sitting upstairs decided to skip the veneration of the cross as the service had been two hours long. As some walked down, another warden asked rudely: "Where are you going?" Does one need permission to leave the church? The warden may have been trying to avoid a rush for the veneration of the cross, but he could have been better mannered in executing his duties. I told this warden of what I thought of his actions. I left the church wondering if I had gone to the cathedral to attend a concert. Will the church soon be selling tickets to attend mass! I appreciate the ushers and wardens helping out in the hot sun from directing traffic, the congregation and making sure that everything is done orderly, but don’t turn the church into a circus or concert, please. It is only going to drive people the faithful away from the church. On Easter Sunday, I attended the 7.30am mass and again the church was packed. Only this time, the door to the gallery upstairs – which at one time was the place for the choir – was closed and a warden stationed to refuse people entry. I wondered if my posting of the Friday experience in the Malaysian Catholic Christians website had anything for the door to be locked. The response I got from the posting was overwhelming. Some took to task the ushers and wardens, saying they acted like bouncers at a concert and ticked then off of being rude. These ushers and wardens were accused of forgetting what "Hospitality Ministers" mean. 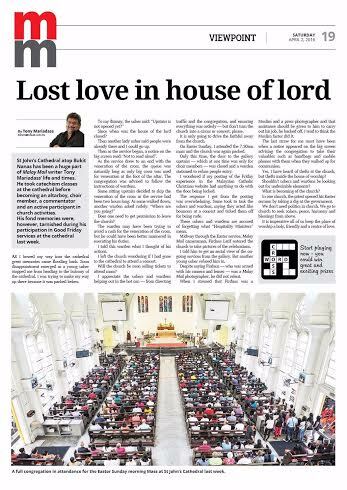 Midway through the Easter service, Malay Mail cameraman, Firdaus Latif entered the church to take pictures of the celebration. I told him to get an aerial view of the ongoing services from the gallery. But another young usher refused him in. Despite saying Firdaus – who was armed his camera and lenses – was a Malay Mail photographer, he did not relent. When I stressed that Firdaus was a Muslim and a press photographer and that assistance should be given to him to carry out his job, he backed off. I tend to think the Muslim factor did it. The last straw for me must have been when a notice on the big screen advising the congregation to take their valuables such as handbags and mobile phones with the when they walked up for communion. Yes, I have heard of thefts in the church, but thefts inside the house of worships? Shouldn’t the ushers and wardens be looking out for undesirable elements? What is becoming of the place of worship? In one church, the priest opened his Easter sermon by taking a dig at the government. It is imperative all of us keep the place of worship a holy, friendly and centre of love.